Flokati rugs are Greek hand-woven area rugs made from 100-percent wool that are almost always a natural, off-white color. They have been produced for centuries and were a staple of early Greek shepherds. The rugs originally serviced the shepherds, being used as clothing, beds for tents, keeping them warm during the long winter months. The 5th century Vlachs, who lived in Samarina, the highest Village on the Pindos mountains, were the inventors of the Flokati Rug. Flokati rugs had very humble beginnings. As shepherds, they raised sheep and goats, producing dairy products sold during the winter in the plains of Trikala, Thesally, Macedonia, and as far as Odessa. The women, having access to the wool, would weave Flokati rugs to be sold at bazaars during the winter months. We have continued the tradition of producing fine quality Flokati and other hand-woven rugs. 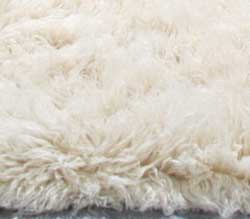 In the 1970s these sheep's wool rugs were very popular, and in recent years they have reemerged in contemporary design. Flokatis are very shaggy, with a pile 3 or 4 inches long. They are cozy and have a great texture. They are relatively inexpensive and not too big, which make them easy to take with you to your next home. They are great in a bedroom or a living room or really any room that is not formal in the traditional sense. They are best used as throw rugs over a wood floor or over a flat floor covering such as sisal. Flokatis suit any look from contemporary to Mediterranean. Today, Flokati rugs portrays sexiness, sensuousness and eternity. Yes, from humble beginnings to today, these rugs still enjoy a niche in the area rug industry. Their unique look and feel make them a natural choice for that special place in the home where warmth and originality are needed.